Pastor Steve Tedder invites the public to attend Sunday services of Valley Bible Fellowship held at Grace Fellowship Church, 326 E. Tehachapi Blvd., at 11:30 a.m. Sundays. Valley Bible Church features a live worship band playing contemporary music. Pastor Ron Vietti is the founder and lead pastor of Valley Bible Fellowship, which began in 1974 in Bakersfield. Valley Bible Fellowship participated in its first Christmas parade in Tehachapi last year, taking home first place for its float. Forty-five years ago, Valley Bible Fellowship opened its doors in Bakersfield and welcomed a congregation of 10 teenagers. Today, VBF has expanded its outreach to include multiple campuses in California, including one in Tehachapi, and another in Las Vegas, streaming live services to 10,000 souls. Lead Pastor Ron Vietti and his wife pioneered VBF in 1974. Although located in Bakersfield, the church attracted Tehachapi parishioners, including Dale and Wendy Whinery, who made the trip each Sunday to hear the word of Pastor Ron. 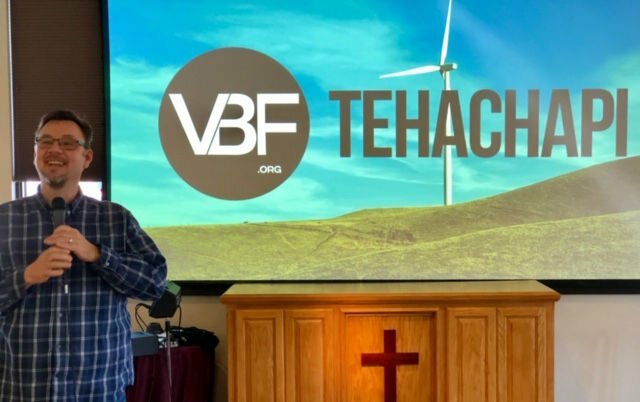 "Dale and Wendy Whinery asked Pastor Ron to start a campus in Tehachapi," said Pastor Steve Tedder, who has been with VBF for 27 years. According to Pastor Steve, Pastor Ron told Dale and Wendy to pray on it, and if it was meant to be, God would make it happen. 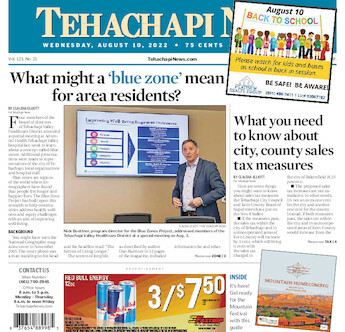 "Pastor Ron and Dale looked for a building in Tehachapi, but they also wanted to see if there would be enough interest and support," said Pastor Steve. 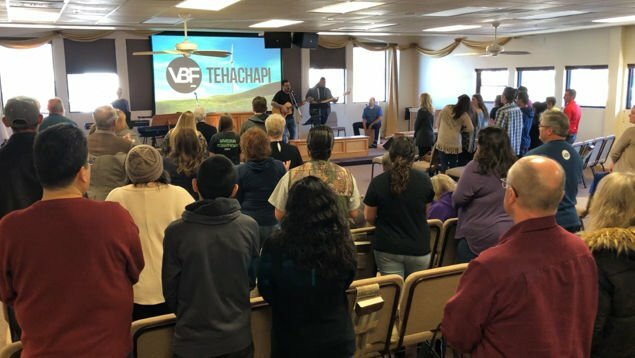 Last August, VBF held its first service in Tehachapi, sharing a building with Grace Fellowship of Tehachapi, located at 326 E. Tehachapi Blvd. The first service proved a success, with 40 people in attendance. "We are a very simple Bible-believing church that desires to teach people how to have a vibrant and living relationship with God through the indwelling of the Holy Spirit," said Pastor Steve. One of VBF's foremost goals is to provide a comfortable atmosphere. Said Pastor Steve, "We are excited to be here and bring value to the community and to people's lives." VBF meets at 11:30 a.m. each Sunday, following Grace Fellowship services. Services include a live worship band and relevant messages. A nursery and children's programs are provided concurrent with the adult service. Life groups are also available for men, women and couples, with a co-ed life group coming soon. VBF participated in its first Christmas parade in Tehachapi last year, handing out 2,500 candy treat bags, and winning first place for its float. In March, VBF provided more than 200 free lunches to the community, and spread grace by handing out gift cards, paying for laundry and car washes and praying for the needs of neighbors. The church is planning a special Golden Egg Hunt starting Friday, April 19, by hiding 50 golden eggs throughout town and posting rules during the week before the hunt and releasing clues that day on its Facebook page at VBF Tehachapi Campus. Prizes will include gift cards, bicycles, iPads and tablets, limited to one per family. "Our approach to the spiritual life is a more out-of-the-box style, and less traditional in structure," said Pastor Steve. "We believe that as the early church in the book of Acts reached out and touched their world with the love and presence of God, we can do the same." For more information, visit Valley Bible Fellowship's website at changeourcity.com or call Pastor Steve Tedder at 325-2251.